Mid City Studio founders William Doran and Lynley Farris stand in front of the outdoor art gallery they helped local students create at BREC’s Spain Street Park. Photos by Collin Richie. The deep brown and bone-white calfskin violin case creaks slightly as the player removes the instrument. In no time, some melodious sonnet is winding its way through an early-morning, eclectic crowd congregated outside of Bethel African Methodist Episcopal Church on the “Old South” end of Mid City. 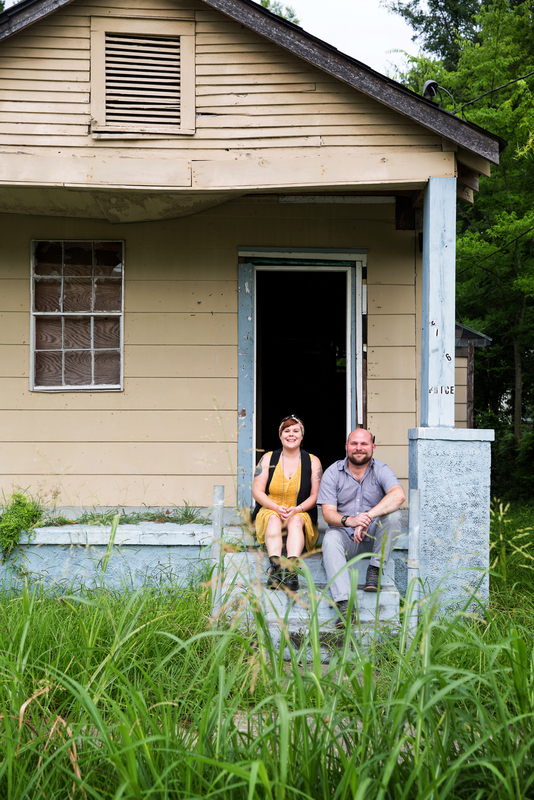 There are musicians of the Baton Rouge Symphony Orchestra, neighbors and outsiders, businessmen, artists and poets. There’s fresh brew from Cafeciteaux Coffee Roasters and a smoked brisket breakfast delivered by City Pork and served up by the church pastor’s wife. But today’s group is really here for the gathering. They want to connect, and they’ve answered the call of Mid City Studio, organizers of this location-hopping monthly meetup called Coffee on the Porch. Mid City Studio is devoted to using curriculum development, design initiatives and social events to make a positive impact on its namesake neighborhood. It was founded by LSU architecture instructor William Doran, who was joined earlier this year by Creative Director Lynley Farris, formerly of Mid City Redevelopment Alliance. The group aims to have nonprofit status by next year. Bernard Terrace Elementary and Dufrocq Montessori Magnet Elementary third graders used disposable cameras to document their lives for this outdoor art gallery at Spain Street Park. Photo by Collin Richie. Unlike many local events, Coffee on the Porch has attracted people from across racial and socioeconomic barriers, and it has gotten people to hang out in parts of Mid City they might otherwise only drive through. Among those in attendance, perceptions of Mid City do seem to be evolving, and much of the coffee talk revolves at least somewhat around what’s going on in the neighborhood. “Those [events] are offering proof that Mid City is no longer the best-kept secret,” says Samuel Sanders, executive director of the Mid City Redevelopment Alliance. Sanders acknowledges that there’s a new positivity about the area’s future. “Mid City has an emerging identity, and there’s a lot of excitement for that potential,” Farris says. The area was not even officially named “Mid City” until the parish’s 1991 Horizon Plan, a fact that suggests this geographical area is more than suited for adaptation. “Even the boundaries of what Mid City is can be seen as shifting, depending on who you talk to,” Farris says. A year ago, Business Report spoke to prominent developers who are eyeing the corridor, labeling the neighborhood as the “next frontier” for Baton Rouge. Recent openings—including Chris Wadsworth’s upscale Creole restaurant Goûter and creative agencies like Slash and Ritter Maher Architects—indicate a renewed interest in Government Street as a cultural district. That interest also shows in upcoming projects including the brick-and-mortar version of Nick Hufft’s popular Curbside Burgers, the mixed-use Square 46 and its multi-tenant dining hall concept White Star Market. But its principals say that Mid City Studio exists to look beyond businesses in the area. Doran sees Mid City’s development as a key entry point for beginning to address some of the challenges facing neighboring north Baton Rouge, such as fresh food access and crime, in higher ratios. Gwen Hamilton, interim head of the East Baton Rouge Parish Redevelopment Authority, understands the importance of the Mid City Studio approach to the overall and cohesive progress of the district. “Grassroots, place-based education projects and social outreach are encouraging to the existing residents, and more importantly, to potential investors,” she says. Earlier this year, Mid City Studio partnered with Bernard Terrace Elementary and Dufrocq Montessori Magnet Elementary and tasked each third grader with making a unique map of Mid City using personal landmarks, such as his or her school, favorite store or Grandma’s house. The kids also collected facts about the neighborhood and documented their lives in pictures with disposable cameras and #IAMMIDCITY markers. 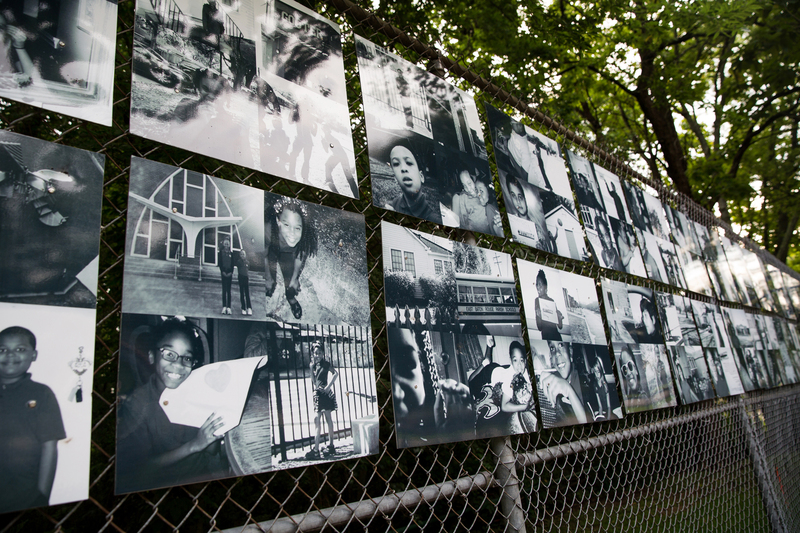 The results are fascinating—all squinty grins and playground selfies, peace signs and neck hugs, streetscapes and landscapes and the long craggy shadow fingers of oak branches stretching across rows of shotgun houses. 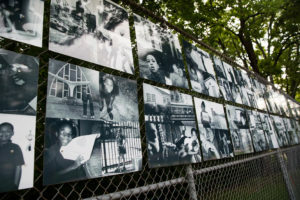 Collectively, they do draw a sense of community, of togetherness, and Mid City Studio has created an outdoor art gallery with them at BREC’s Spain Street Park. Doran plans for the photo installation at Spain Street Park to begin rotating to other Mid City locations later this year as his organization raises funds for future initiatives and plans its next move, which includes a new workspace next to the station for WHYR Baton Rouge Community Radio. A Coffee on the Porch regular, artist and WHYR board member Karla King says Mid City Studio has already affected the area in positive ways through its open-minded approach to dialogue and problem-solving. She calls Doran and Farris incredible connectors with people from all walks of life. For Doran, the partnership with WHYR will open many doors as Mid City Studio lays foundations in the area. He envisions a storefront featuring locally made goods and neighborhood-centric artwork, as well as a vibrant community space for meetings, markets, workshops and events. While the need is great and his ideas are many, Doran knows change must come one step at a time, and right now, he and Farris’ hearts are with those living around Spain Street Park.